Stocks traded to new record highs last week on the back of new central bank initiatives to prop up struggling economies around the world. The People's Bank of China announced an unexpected cut in its benchmark lending and deposit rates for the first time since 2012. 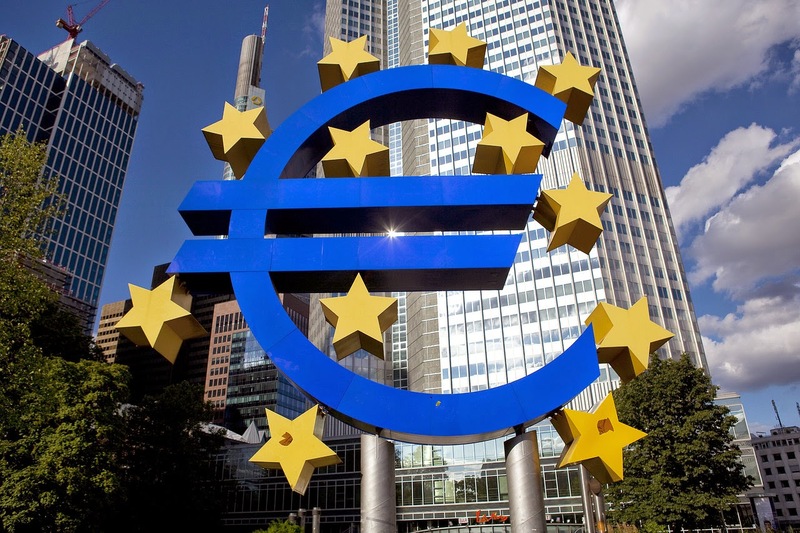 Hours later, ECB President Mario Draghi made another promise that his central bank would take new steps to bolster European growth and the ECB announced that it had begun buying back asset-backed securities. Coming two weeks after the Bank of Japan and Japan's large public pension fund announced manic interventions into financial markets to support that country's failing economy, investors have dismissed any concerns that the end of QE in the U.S. will deny them the liquidity they have feasted on for the last few years. Since the October flash sell-off, markets have gone parabolic and totally disconnected from the struggling economies that are supposed to support them. Last week, the Dow Jones Industrial Average rose by 175 points or 1% to close at a record 17,810.06 while the S&P 500 jumped 24 points or 1.2% to a record close of 2,063.50. Both indices are up roughly 13% from their October 15 low in a mere five weeks. The Nasdaq Composite Index added 24 points or 0.5% to end the week at 4712.97 while the small cap Russell 2000 finished unchanged at 1172.52. The Russell has outperformed larger stocks since mid-October. In the bond market, rates remain low with the yield on the benchmark 10-year Treasury ending the week at 2.32%. The only notable market weakness in the U.S. has been the high yield bond market where spreads and yields have widened about 30 basis points in November, most notably in the lowest rated names. While there are no immediate large credit problems stalking the market other than the Caesars Entertainment Corp. mess, there appears to be a buyer's strike among the investors who traffic in these types of bonds as they reduce risk at the end of what has been a difficult year for many of them. With stock markets running far ahead of economic growth, investors should be asking whether the markets are getting ahead of themselves. Of course, they were asking the same question a year ago as well. And for much of 2014, it appeared that 2013's spectacular returns had borrowed from the future. But the recent run suggests that as long as central banks keep printing money, the future is now. Goldman Sachs hit a cautious note, however, in its market forecast for 2015 with a 2100 year-end target that we might hit before the end of this year at the rate we are going. A major Wall Street firm calling for only a 5% rise in stocks next year should raise serious questions since these firms are paid to be bullish. It appears that Goldman, a firm that can't be easily fooled, is trying to warn investors without coming right out and saying it that things are not as wonderful as they seem on the surface. Goldman actually expects the market multiple to drop slightly to 16x, again an extremely unusual call for a major Wall Street firm in the business of dishing out pure hogwash. It also expects ten-year rates to rise to 3% in the U.S., 0.80% in Japan and 1.25% in Germany. While this forecast would still leave rates low in absolute terms and do little to upset markets, they would signal very large percentage moves of 30% in the U.S., 60% in Japan and 50% in Germany that could inflict serious harm on traders (especially leveraged ones). On the other hand, rising rates will handsomely reward investors who are properly positioned for them (as they should be – with rates at such record lows only a global depression would make shorting bonds a dangerous trade today). Finally, Goldman calls for the Euro to drop to $1.15 and the Yen to drop to 130. While all forecasts are best served with salt, Goldman's forecast has a great deal to say about the fragile state of markets if one reads it correctly. The other thing driving markets higher is a record volume of M&A transactions that have now hit more than $3 trillion in 2014. Many observers view M&A as a sign of confidence in the economy. I tend to view them more of a sign that corporate executives are finding a dearth of organic growth in their businesses. Further, mergers tend to result in cost savings in the form of layoffs and other efficiencies that subtract rather than add to economic growth. Nonetheless, they unquestionably lead to short-term stock gains so the market (and financial media) celebrates them. Last week, we saw two megadeals announced. Halliburton's demands come as crude oil prices have fallen dramatically and as the U.S. oil industry looks to an uncertain future. Much is unclear: how much producers will rein in equipment and service spending, whether oil prices will sink or swim, and how much Baker Hughes would be worth in six months after what would likely be a bruising battle for control of its board." On a pro forma basis, the combined companies had 2013 revenues of $51.8 billion, more than 136,000 employees and operations in more than 80 countries around the world. BHI was trading at 20x earnings before the deal was announced so HAL is paying a high price for its rival. No doubt many of those employees will lose their jobs since the companies expect to realize $2 billion in annual cost savings. In a second megadeal in the pharmaceutical industry, Actavis plc (NYSE: ACT) agreed to buy Botox maker Allergan Inc. (NYSE: AGN) for about $66 billion. The purchase price is $219 per share, 10% above AGN's closing price on the day before deal was announced although the offer was widely rumored. Allergan turned to Actavis to ward off a hostile bid from Valeant Pharmaceuticals Intl. Inc. (NYSE: VRX) and hedge fund activist Bill Ackman. Valeant and Mr. Ackman's fund will end up with more than a $2 billion profit on their investment – and lingering questions about whether they violated insider trading laws – but all their investors will care about is that they made money. Remember: we are in a bull market where moral and legal niceties are ignored. Markets appear hell-bent on rallying through the end of the year as active managers desperately try to dress up another year of underperformance. Goldman Sachs points out that the average hedge fund index is -1% for the year compared to +13% for the S&P 500 and +11% for the average large-cap mutual fund (and with much higher fees obviously) largely due to the "smart money" having serious doubts about economic growth and corporate earnings. Put another way, hedge funds have chosen to fight the Fed and they have lost. This is true of other active managers in strategies that are supposed to make money when the market rises. Now everyone is chasing performance heading into year end and this is contributing to the market's rise. Like the reaction to desperate moves by central bankers, this performance-chasing has nothing to do with fundamentals and could end badly in January. The question remains when markets will begin to pay attention on a sustained basis to anything other than monetary policy. There is a political showdown shaping up in Washington, D.C. in the lame-duck session of Congress now that President Obama has moved ahead unilaterally on immigration. Political gridlock could lead to a government shutdown or other signs of political paralysis that make it clear to the market that there will likely be no movement on important issues like tax reform or fixing Obamacare over the next two years. 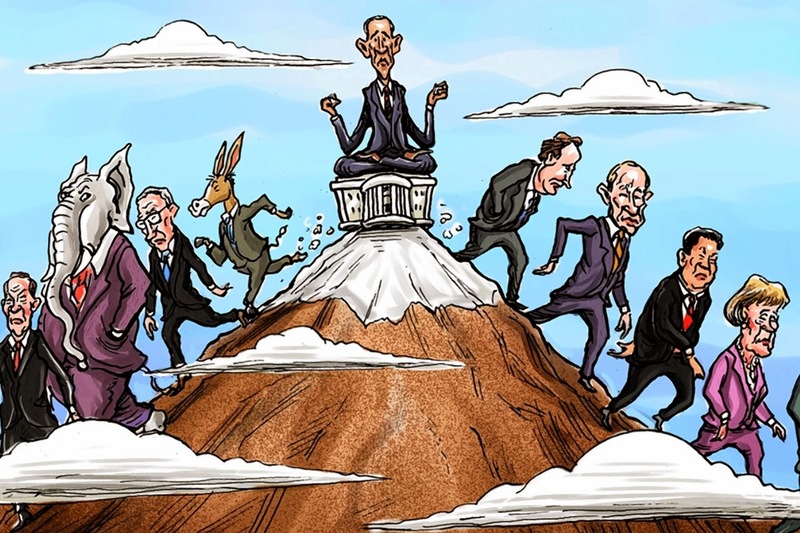 Markets may be willing to live with bad government as long as they keep rising, but the minute they falter they will start screaming for effective leadership. For the moment, however, it appears that investors are focused on dressing up their performance for year-end and accepting the gifts being given to them by increasingly desperate central bankers. As T.S. Eliot famously wrote, we live in an era of hollow men. Editor's Note: Michael Lewitt publishes the highly regarded The Credit Strategist , and was recognized by the Financial Times for forecasting both the financial crisis of 2008, and also the credit crisis of 2001-2002. His 2010 book, The Death of Capital: How Creative Policy Can Restore Stability (John Wiley & Sons) was included in the curriculum at the University of Michigan and Brandeis University. IN BEIJING, a city of grandiose government offices, the central bank stands out for its modesty. Its headquarters are small and dated; plans for a big, gleaming extension have so far come to nothing. Cramped as they are, however, these digs are an apt symbol of the central bank’s restraint. For nearly four years the People’s Bank of China (PBOC) has classified monetary policy as “prudent”, which is supposedly a neutral stance—not too tight, not too loose. In reality it has been tightening, to cool an overheated property market and slow the alarming accretion of debt. At the same time, the central bank has chipped away at vestiges of central planning with changes to its currency and interest-rate regimes. 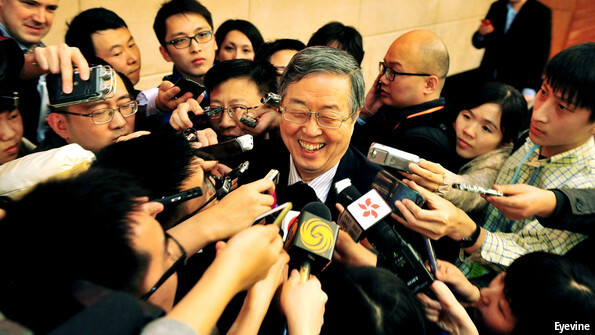 The PBOC is far from independent, but under Zhou Xiaochuan (pictured), its governor since 2002, it has acquired real clout as it has doggedly pursued its dual objectives of restraint and reform. These two aims were complementary in 2011, when the central bank first embraced prudence. Nominal growth was still running at 18%, a heady pace even by Chinese standards; slowing breakneck investment was essential. Yet times have changed. The economy is now on track for its weakest year since 1990, sliding below the government’s goal of 7.5% growth; inflation is at a five-year low, nearly two percentage points below the official 3.5% target. The central bank faces mounting calls to lower rates. But advisers say it fears sending the wrong message: by easing, it might signal an end to restraint and, by extension, to reform. The combined amount of the infusions, if as big as reported, would be huge—equal to more than three months of America’s now-completed QE scheme when it was at its height, or to five months of Japan’s current programme. The impact of China’s easing, however, has been underwhelming. It has not reached the real economy. Short-term interest rates have fallen: a closely watched interbank rate is down by almost two percentage points this year, to 3.2% (see chart). But the rate at which banks lend to businesses, which matters more for growth, has remained stuck at about 7%. The central bank’s lack of transparency has sown confusion. “The more policy tools you have, the harder it is to predict changes in any one of them,” says Song Yu of Goldman Sachs. A recent Barclays survey ranked the PBOC third-worst of 14 big central banks in terms of communication, behind only Turkey’s and Russia’s. Even when providing partial confirmation of its covert easing, the PBOC’s message was muddled. The purpose was “to guide banks to lower lending rates”, it said, an apparent indication of an intention to relax policy. But in the next breath it added that the easing was to compensate for a decline in capital inflows, in order to “maintain a neutral, appropriate level of liquidity”—that is, to keep policy unchanged. The central bank is right to be concerned about debt. Economy-wide debts have soared to 250% of GDP, up by 100 percentage points since 2008. Increases of that magnitude have presaged financial crises in other countries, so tighter policy would seem in order. Yet real interest rates have climbed to more than 8% for industrial companies, since the prices at which they sell their wares are actually declining. That, in turn, makes debts much harder to service than anticipated. Cutting interest rates while enforcing capital rules to prevent banks from issuing a gusher of new loans would be a better way to rein in debt. The PBOC has talked instead of “fine tuning” monetary policy and making it more “targeted”. In the background are questions about the future of the long-serving Mr Zhou. He was due to step down in 2013, having reached the official retirement age of 65. When his term was extended, it was seen as an endorsement of his reformist agenda. But a few months ago, word spread in Beijing that he might soon be replaced. Some even suggested that he had pushed too hard to deregulate interest rates. People familiar with the PBOC say that talk of Mr Zhou’s imminent retirement has since died down. Yet he will eventually depart. His legacy will be extremely positive overall: he has presided over an era of rapid growth, stable inflation and progress in financial reforms. But his final years in office are turning into a bit of a muddle. The bond-market sands are starting to shift. That is particularly true in the U.S., where investment-grade corporate bonds, one of the long-standing beneficiaries of the financial crisis, have started to come under pressure. The gap between U.S. corporate bond yields and U.S. Treasurys now stands close to its widest this year, around 1.24 percentage points, according to Barclays indexes. Year-to-date returns have faded from above 8% in mid-October to closer to 6%. That should give pause to investors in U.S. stocks, which have recovered from October’s turmoil to set highs for the year. It also poses questions about performance in Europe, where corporate bond spreads over haven government bonds are close to their tightest level for the year. Indeed, until late August, European and U.S. spreads had moved almost in lock step. Companies are finding issuing new bonds in the U.S. a tougher proposition than just a few months ago. Issuance has been heavy, with mergers-and-acquisitions activity increasing bond supply. Bankers report that investors are becoming pickier, and as a result borrowers that are less well-known or are raising relatively small amounts are having to pay up to attract orders. Issuers looking to sell long-dated bonds have had to pay higher new-issue premiums of about 0.2 percentage point above market yields, Royal Bank of Scotland strategists note. The clearest explanation: shifts in monetary policy. The Federal Reserve has wound down its bond purchases, while the European Central Bank is only just starting to expand its balance sheet again. European corporate bonds have benefited from speculation the ECB may buy paper in this market. U.S. investment-grade bonds face stiffer competition for investor attention with the Fed no longer printing money. The corporate bond market also is grappling with a fundamental threat to credit quality: The declining oil price threatens the U.S. energy sector. That is mostly playing out in the high-yield market, in which energy companies are the largest industry grouping at 16% of market value, Deutsche Bank notes. But it is also filtering through to the investment-grade market, in which low yields provide little cushion against credit deterioration. These factors help explain the divergence between European and U.S. bond markets, something that is good news for the ECB. It would have a headache if higher U.S. yields drove up borrowing costs in Europe. The gap between U.S. and European bond markets can persist and even widen on that basis. The divergence with stocks is trickier to figure out. Some of it is down to bond-market factors such as heavy supply. It also perhaps recognizes that companies in the U.S. are more focused on activity that tends not to be such good news for bondholders such as M&A or share buybacks. Still, stock investors may find it tougher to keep their nerve if U.S. corporate bond yields start rising in earnest. 7:18PM GMT 21 Nov 2014. China has abandoned its policy of monetary tightening, cutting interest rates for the first time in over two years to head off a corporate crunch and mounting dangers of deflation. The move set off an instant spike in the price of crude oil and other key commodities as traders bet on a fundamental pivot by the Chinese authorities and a return to the bad old ways of credit-driven growth. The People’s Bank of China caught markets off guard, cutting the benchmark lending rate by 40 basis points to 5.6pc and the deposit rate by 25 basis points to 2.75pc. It also liberalised bank rates in a free market tilt. The central bank denied that it is changing tack, insisting that the cuts target a specific problem of high-financing costs for firms. “It does not signal that the direction of policy has changed. There is no need for strong stimulus," it said in a rare statement. Tao Wang from UBS said falling inflation has caused the real cost of borrowing for average companies to rise from zero to 5.5pc since 2011, a drastic form of passive tightening. The interest burden for non-financial companies has jumped from 7.5pc to 15pc of GDP over the same period. Yet the rate cuts are a clear shift in policy from the piecemeal liquidity injections of recent weeks, a sign that Beijing is alarmed by the depth of the economic slowdown. HSBC’s gauge of factory output fell to a six-month low in November, touching the contraction line of 50. President Xi Jinping said last week that there are risks to growth, but they are “not so scary”. Jonathan Fenby from Trusted Sources said the cuts were needed to offset $250bn of tightening caused by a clamp-down on the shadow banking system, which has been frozen over the last two months. “Parts of the private sector have been really squeezed. Mining stocks are shooting up in Australia and North America on this move but people are not looking at the rest of the story,” he said. China is uncomfortably close to deflation, made worse by the plunge in the Japanese yen, and by China’s quasi-peg to the soaring US dollar. The country is importing a contractionary policy at a time when its housing boom is already wilting, with prices down for the last six months. Factory gate prices have dropped for 32 months, and pressures are spreading to consumer inflation. The headline rate dropped to 1.6pc in October. Mr Chovanec said China is so addicted to credit that it needs loan growth near 20pc to keep the game going. 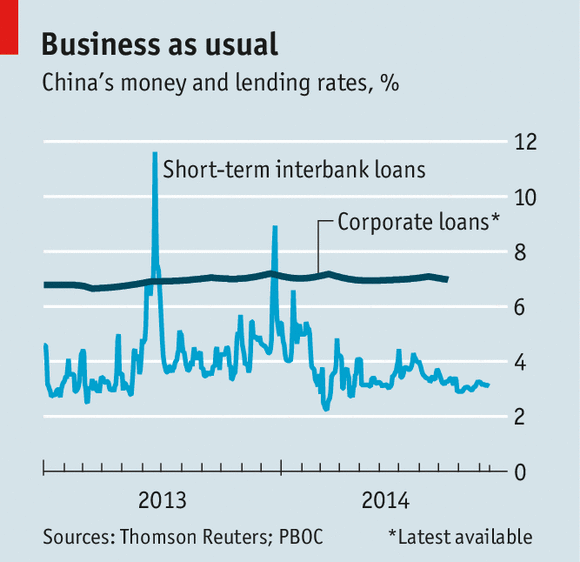 “Credit growth has fallen to 13pc and that is so tight for China it is strangling them. They are getting less GDP bump out of more and more credit, and that tells you loss-making assets are being rolled over. Nothing but creative accounting will stop non-performing loans from rising,” he said. Wei Yao from Societe Generale said bad loans are rising at a clip of 50pc a year. "The worst is still to come and banks know it. Chinese banks have doubled their loan loss provisions," she said. "But the bigger concern lies with state-owned enterprises (SOE). We estimate SOE debt at close to 100pc of GDP, twice as much as private corporate borrowing. Given that banks have always preferred SOEs, a disproportionally large part of banks’ balance sheets is probably locked in to non-performing SOE loans," she said. Analysts said the State Council may have forced the hand of the central bank, which has been trying to wean the country off credit before it is too late. The debt ratio has reached 250pc of GDP by some measures, an unprecedented level for a large developing economy. Mark Williams from Capital Economics said growth is cooling but there is no sign yet of serious distress. “We think this is fairly gentle and manageable. We should start to worry if we hear of a lot of firms going under or jobs being lost, but so far that is not happening. Wage growth is running at double digit rates,” he said. "We don’t think much of the links that some are drawing between the PBOC’s moves today, loosening by the Bank of Japan and the European Central Bank, and the value of the renminbi," he said. The bank could at any time drive down the Chinese currency by reverting to its old policy of purchasing foreign bonds. "If the People’s Bank did want to weaken the renminbi, it has $3.9 trillion of foreign exchange reserves to remind it what to do. There is no evidence that it wants to." Wao Yao agreed that there is no significant shift to a looser policy, arguing that the liquidity injections over recent months are chiefly intended to compensate for the contractionary effect of reducing purchases of foreign bonds. The PBOC has explicitly stated this in its latest quartely report. The government is targeting jobs and seems willing to tolerate lower growth so long as unemployment stays near 5pc. The labour force is shrinking by three million a year, a legacy effect of China’s one-child policy. Urban migration from the country is slowing fast. This is automatically tightening the labour market, and greatly reduces the risk of a social explosion. It may yet be too early to conclude that the President Xi has capitulated and returned to stimulus as usual. One of the warehouses operated by Goldman Sachs warehouse subsidiary Metro International Trade Services on behalf of London Metal Exchange is seen in Detroit July 12, 2011. NEW YORK (Reuters) - Complex deals employed by Goldman Sachs' (GS.N) metals storage unit to build vast stockpiles and then maintain queues test the spirit of the London Metal Exchange operating code, shocking many traders and confirming others' suspicions. But the intricate transactions that saw Metro International Trade Services LLC shell out millions of dollars to customers to join exit queues to bolster rental income was within the rules, according to two senior warehousing executives and two veteran traders. 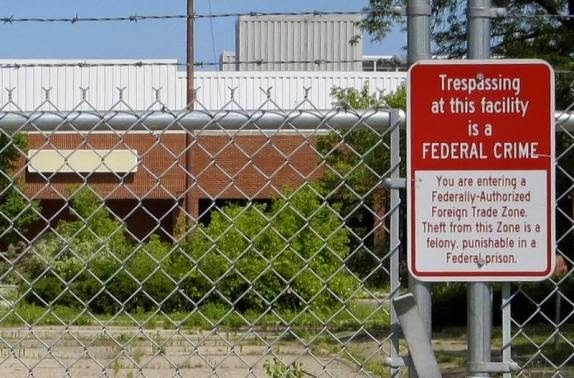 An explosive U.S. Senate report released on Wednesday revealed the "imaginative" methods used to lure millions of tons of aluminum into Detroit, Metro's headquarters, and then keep it there over the past four years. A fiery hearing of the Senate's Permanent Subcommittee on Investigations on Thursday offered the clearest insight yet into the deals that metal users say created bottlenecks, leading to two-year long queues and pushing physical prices to record highs even as oversupply grew. For Nick Madden, Senior Vice President and Supply Chain Officer of Novelis, the world's biggest aluminum user, the report confirmed his "worst fears", he told the subcommittee hearing led by Democrat Senator Carl Levin. It also explained the "strange" things going on in the opaque market over the past four years, he said. Madden has been one of the most fiercest critics of the LME and the warehouses, which he has blamed for years-long queues and inflated premiums, costing consumers billions of dollars in added costs. While the detailed report was critical of how the bank has exploited huge commodity stockpiles, it did not contain any smoking guns. One warehousing source, who is familiar with these transactions, said what he read in the report was "immoral, but not illegal". Chris Wibbelman, Metro president and chief executive, rejected the report's findings in testimony to lawmakers on Thursday, saying the business has played by the rules. Still, the details reignited a years-long debate on how the ownership of warehouses has transformed the metals market. Madden has repeatedly called on regulators to ban trading houses, like Glencore (GLEN.L) and Trafigura [TRAFGF.UL], and banks from owning storage sheds. Massive 100,000-metric ton (110,230 tons) cancellations of warrants in Detroit and Vlissingen in the Netherlands, where Pacorini Metals, Glencore's storage business, has the majority of its sheds, have roiled the market since 2010. The first alarms were sounded within Metro as early as December 2010 when Mark Askew, then vice president of marketing, said he was worried about rumors that a big cancellation of warrants was aimed at blocking other customers in the queues, the report showed. That was just months after the first of six such merry-go-round deals that saw the wait time balloon to as long as two years, with millions of tonnes stuck in queues. "I remain concerned, as I have expressed from [the] start, regarding 'Q management' etc" he wrote in an email to Wibbelman. He quit in April 2013. Wibbelman told the subcommittee in closed-door meetings that Askew "had never liked the idea" of offering financial incentives to existing Metro customers, the report said. He denied that it was designed to help put a queue in place to block other clients from leaving. What's not clear is whether the report and the public airing of concerns about the deals by the Senate subcommittee may exert pressure on the Commodity Futures Trading Commission and other regulators. Under new owners, the LME has tried to introduce sweeping new warehousing rules, but has faced legal challenges from Rusal Plc (0486.HK). Aluminum producers benefit from the high premiums, particularly when LME prices were below the cost of production. CAMBRIDGE – At a closed-door conference attended by senior bankers, regulators, and some academics, Federal Reserve Governor Daniel Tarullo and Federal Reserve Bank of New York President William Dudley used their bully pulpit to do something unexpected. Instead of focusing on how to bolster bank stability – channeling more capital toward the largest institutions, curbing their riskiest activities, and determining how to manage a failing bank without bailing it out – the officials discussed the bankers themselves. Tarullo focused on managerial misbehavior, arguing that managers who do not comply fully and willingly with regulations should face tougher sanctions than they do now. Instead of blaming “a few bad apples” for wrongdoing, he insisted, institutions should implement controls that prevent “bad apples” from poisoning the organization. To this end, organizations should embed respect for law, regulation, and the public trust in internal compensation systems. Moreover, Tarullo cited criminal prosecution and imprisonment of individuals as the most effective way to deter illegal conduct, such as breaches of antitrust law. Of course, as he acknowledged, prosecuting an individual for such violations is difficult, because regulators lack criminal enforcement powers, evidentiary hurdles are high, and the circumstances are often uncertain. But regulators have not taken enough advantage of the authority that they do have to punish errant managers: they can ban these individuals from working in finance. According to Tarullo, a few well-chosen “bans from banking” could change the financial industry for the better. He urged bank boards and senior executives to preempt such bans by firing highly problematic managers publicly, rather than sending them quietly out the back door. Public executions would deter the rest of the organization from bad behavior. Like Tarullo, Dudley stressed that violations should not be treated as isolated actions by deviant employees, but as evidence of failure by senior managers – from the boardroom to the executive suite – to orient bank culture properly. Violations should thus catalyze a concerted effort by senior managers to bring so-called rogue bankers under control and to infuse their organizations with an ethos of compliance and integrity. If they are unable to do so, Dudley argued, a reasonable conclusion would be that the organization is too big to manage. For at least a few listeners, this statement probably evoked memories of the trader known as the “London Whale,” who lost at least $6 billion at JP Morgan Chase – America’s largest bank – in 2012. The bank’s risk-management team, reputedly the best in the world, failed to identify a rogue trader in their midst until it was too late. The focus on individuals’ responsibility within banks represents a notable change in regulators’ approach, and it was reinforced by a third initiative, which other speakers emphasized: using deferred debt-based compensation to tie managers’ pay to bank safety and soundness. Catalyzing a shift in bank culture will not be easy. Bankers know that assuming substantial amounts of low-probability, high-impact risk often benefits bank shareholders and bolsters their own bonuses. But, when things go wrong, the government picks up much of the bill – and the real economy suffers. Complicating matters further is that risk-taking by banks – even at extreme levels – is not always unethical, rogue, or fraudulent. It often appears responsible and innovative. The problem with innovation is that no one can predict the precise impact it will have. In fact, the 2008-2009 financial crisis was more a consequence of error and misdirection than fraud and explicit misconduct by bankers. Nonetheless, the kind of cultural and behavioral initiatives that Tarullo and Dudley proposed are worth pursuing. Indeed, aligning the financial interests of managers and senior bankers with regulators’ efforts to boost capital, reduce risk, and make bank failure a real possibility would go a long way toward making banks safer. But there is one critical caveat: Regulators’ core organizational objectives must have priority over soft, culture-related goals, with the latter supporting – not displacing – the former. Tarullo and Dudley understand this – but other, less adept officials may not. If people-focused efforts begin to eclipse regulators’ core responsibilities, much of the progress that has been made in recent years toward bolstering banking safety will be lost. That could turn out to be the riskiest move of all. IT WAS great while it lasted. In a golden period from 2003 to 2010 Latin America’s economies grew at an annual average rate of close to 5%, wages rose and unemployment fell, more than 50m people were lifted out of poverty and the middle class swelled to more than a third of the population. But now the growth spurt is over. What some worried would be a “new normal” of expansion of 3% a year is turning out to be far worse. The region’s economies will on average grow by only around 1.3% this year. Analysts continue to slash their forecasts, as they have done for the past two years (see chart). They now expect only the mildest of recoveries next year: both the IMF and the World Bank foresee growth of just 2.2% in 2015. Latin America is decelerating faster than much of the rest of the emerging world, points out Augusto de la Torre, the bank’s chief economist for the region. Alejandro Werner, his counterpart at the IMF, sees growth averaging just 2.7% over the next five years. Some of the reasons are obvious. The biggest factor is the end of the commodity boom. As China’s growth slackens, commodity prices have slumped back to their lowest levels since the 2009 world recession. Now the oil price has been hit, too, thanks mainly to increased output in the United States. 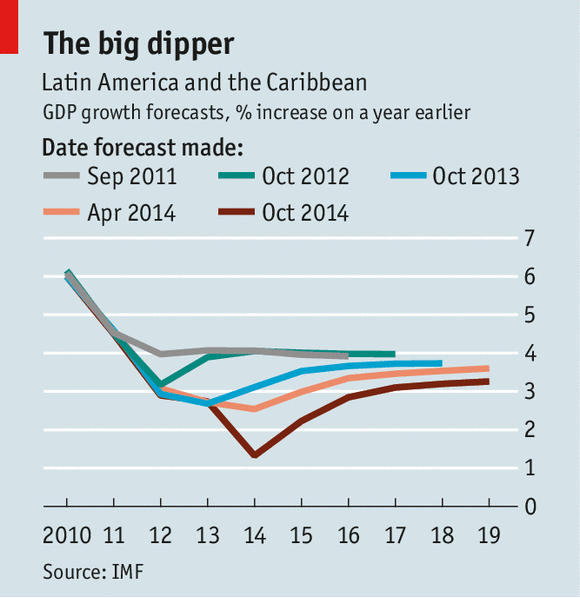 All this has hurt the commodity-producing economies of South America, though some benefit from cheaper oil. The outlook for Mexico, with its structural reforms and manufacturing ties to North America, is slightly brighter. A second oft-cited cause of the Latin doldrums is the move to normal monetary policy in the United States, which will raise the cost of borrowing in the region. But there are few signs of this having an impact yet. Latin American companies are issuing bonds at an accelerating rate. Some economists now reckon that the boom masked deep-rooted structural problems. Latin America’s record in productivity may have been even worse than the data seemed to indicate, says Mr de la Torre. The effect of changes in the terms of trade, and the weight of service businesses and of the informal economy in the region, makes this especially hard to calculate. Bello has two other hunches. One is that the region’s poor education and skills shortage have caught up with it. To watch and wait as staff in shops or at telecoms companies battle with IT equipment that either they don’t know how to operate or is frequently out of order is to wonder whether technology is enhancing or undermining productivity. The second is that the failure to invest in public transport means that the region’s big cities, clogged with the new cars the boom afforded, reap fewer economies of scale and specialisation, because people find it so difficult to move around. What does seem clear is that the region is suffering a structural supply-side shock. Many economies have been operating close to capacity, points out Mr Werner. So demand-priming stimulus—such as Brazil’s loose fiscal policy or Peru’s recent giveaway of an extra bonus to public employees—looks mistaken. Fiscal balances have weakened by an average of three points of GDP since the 2009 recession. Nevertheless, low debt, stronger banks and more reserves permit looser monetary policy in some places. Many Latin currencies are depreciating, without prompting the panic of the past and thus offering the hope of growth in exports besides commodities (though it is unclear how many companies may find it harder to repay their foreign bonds). With borrowing costs still low, now is the time for these countries to step up investment in infrastructure. Such investments, like much-needed efforts to improve education and training, take years to bear fruit. The problem is that Latin America’s leaders confront a mobilised population that has grown used to the good times. This calls for politically deft statesmanship. Where it is absent, Latin America may become more combustible in the next few years. NEW HAVEN – In economic policy, as in most other areas, actions speak louder than words. By cutting its benchmark policy interest rates, the People’s Bank of China (PBOC) has underscored the tactical focus of the government’s stabilization policy, which aims to put a floor of around 7% on GDP growth. Achieving this goal will be no small feat. China’s economy is facing structural headwinds arising from the shift to a new model of services- and consumer-led growth, and cyclical pressure, as a tough global environment puts downward pressure on the old export and investment-led model. The cyclical challenges, in particular, are proving to be more severe than anticipated. Though exports have declined considerably from their pre-crisis peak of 35% of GDP, they continue to account for about 24%, leaving China exposed to the global growth cycle – especially to markets in the developed world, where demand is exceptionally weak. Indeed, 42% of Chinese exports go to Europe, the United States, and Japan – three economies that are flirting with secular stagnation. And Europe, China’s largest export market, has struggled the most. Given that development strategies begin to fail when economies reach middle-income status – a threshold that China is rapidly approaching – China cannot afford to allow mounting cyclical risks to undermine its structural transformation. Modern history shows that the best way for a developing country to become ensnared in the dreaded “middle-income trap” is to cling to its old model for too long. The fact is that only structural transformation can lift a middle-income developing country to high-income developed status. Fortunately, China’s leaders recognize this, and are committed to achieving it. President Xi Jinping has been spearheading the effort to press ahead with reform and rebalancing. A year ago, at the Third Plenary Session of the 18th Central Committee of the Chinese Communist Party (CCP), Xi and his team created the country’s most ambitious economic-reform agenda in 35 years. This, together with the 12th Five-Year Plan of 2011, highlights the authorities’ commitment to bolstering the services sector and domestic consumption. At the same time, China has been shifting responsibility for implementing reform from its antiquated planning apparatus (the National Development and Reform Commission) to a more effective market-based mechanism embedded in the CCP’s structure (the Leading Small Group for Comprehensively Deepening Reforms). Add to that Xi’s unprecedented anti-corruption campaign, and there is no turning back on China’s road to rebalancing and structural change. But the risk of cyclical disruptions, such as an unexpected decline in global economic growth, remains. This raises an important tactical challenge for China. How can it stay the reform course without suffering a significant growth slowdown in the short term? This is not the first time that China has confronted this challenge; indeed, the Great Recession of 2008-2009 pushed China to the brink of recession. With global trade collapsing and Chinese export demand having plummeted from 26% annual growth in mid-2008 to a 27% contraction by early 2009, the government moved aggressively to inject CN¥4 trillion ($586 billion) into the economy. Though this enabled growth to recover by the end of 2009, it also contributed to new problems, including excessive debt, a property-market overhang, and mounting local-government financial risk. The last thing China needs is more fiscal stimulus. Today’s cyclical disruption pales in comparison to that of 2008-2009, and, unlike the fiscally reckless developed economies, China recognizes excessive debt as a threat to sustainable growth and development. Moreover, unlike major developed economies, most of which have used up all of their conventional monetary-policy ammunition by reducing their policy interest rates to zero, China has plenty of monetary stimulus on reserve to address cyclical disruptions. In these circumstances, it makes sense for China to lean more on monetary policy than on fiscal expansion. Nonetheless, the PBOC’s tactical decision is not without potential pitfalls – not least because it encourages the extension of more credit at a time when China is trying to wean itself from debt-intensive growth. A key challenge will be to avoid escalating credit risk, which could undermine the process of reform and rebalancing. From the start, China’s leaders knew that the interaction between structural transformation and the business cycle would be complicated. As former Premier Wen Jiabao noted nearly eight years ago, China’s economic growth had become increasingly “unstable, unbalanced, uncoordinated, and unsustainable.” The longer China delayed addressing its problems, the more intractable the solution became. Xi and his colleagues are resolute in remaining on course to rebalance the Chinese economy, while remaining acutely aware of the near-term cyclical risks. After all, China’s vulnerability to such risks is rooted in its old growth model, which was allowed to remain in place for far too long. With the recent monetary easing, the Chinese authorities seem to be drawing a line in the sand to prevent an excessive drop in growth, suggesting that they view a cyclical disruption as a real threat to the country’s longer-term structural-reform agenda. To the extent that those fears persist, additional monetary easing can be expected. Facing adversity, Obama has no idea how to respond. Seven years ago I was talking to a longtime Democratic operative on Capitol Hill about a politician who was in trouble. The pol was likely finished, he said. I was surprised. Can’t he change things and dig himself out? No. “People do what they know how to do.” Politicians don’t have a vast repertoire. When they get in a jam they just do what they’ve always done, even if it’s not working anymore. This came to mind when contemplating President Obama. After a devastating election, he is presenting himself as if he won. The people were not saying no to his policies, he explained, they would in fact like it if Republicans do what he tells them. You don’t begin a new relationship with a threat, but that is what he gave Congress: Get me an immigration bill I like or I’ll change U.S. immigration law on my own. Mr. Obama is doing what he knows how to do—stare them down and face them off. But his circumstances have changed. He used to be a conquering hero, now he’s not. On the other hand he used to have to worry about public support. Now, with no more elections before him, he has the special power of the man who doesn’t care. They have had no good experiences with him. The Democrats don’t like him, for their own reasons plus the election loss. Before his post-election lunch with congressional leaders, he told the press that he will judiciously consider any legislation, whoever sends it to him, Republicans or Democrats. His words implied that in this he was less partisan and more public-spirited than the hacks arrayed around him. It is for these grace notes that he is loved. No one at the table looked at him with colder, beadier eyes than outgoing Senate Majority Leader Harry Reid , who clearly doesn’t like him at all. The press doesn’t especially like the president; in conversation they evince no residual warmth. This week at the Beijing summit there was no sign the leaders of the world had any particular regard for him. They can read election returns. They respect power and see it leaking out of him. If Mr. Obama had won the election they would have faked respect and affection. But Nixon had one advantage Obama does not: the high regard of the world’s leaders, who found his downfall tragic (such ruin over such a trifling matter) and befuddling (he didn’t keep political prisoners chained up in dungeons, as they did. Why such a fuss?). Nixon’s isolation didn’t end well. When politicians do this they’re trying to mush words up so nothing breaks through. They’re leaving you dazed and trying to make it harder for you to understand what’s truly being said. It is possible the president is responding to changed circumstances with a certain rigidity because no one ever stood in his way before. Most of his adult life has been a smooth glide. He had family challenges and an unusual childhood, but as an adult and a professional he never faced fierce, concentrated resistance. He was always magic. Life never came in and gave it to him hard on the jaw. So he really doesn’t know how to get up from the mat. He doesn’t know how to struggle to his feet and regain his balance. He only knows how to throw punches. But you can’t punch from the mat. He only knows how to do what he’s doing. In the meantime he is killing his party. Gallup this week found that the Republicans for the first time in three years beat the Democrats on favorability, and also that respondents would rather have Congress lead the White House than the White House lead Congress. A few weeks ago a conservative intellectual asked me: “How are we going to get through the next two years?” It was a rhetorical question; he was just sharing his anxiety. We have a president who actually can’t work with Congress, operating in a capital in which he is resented and disliked and a world increasingly unimpressed by him, and so increasingly predatory. Anyway, for those who are young and not sure if what they are seeing is wholly unusual: Yes, it is wholly unusual.